Gerard (Gerrit) van Honthorst (1590-1656), Adoration of the Shepherds (Die Anbetung der Hirten, Adorazione dei Pastori, 1622). 164 x 190 cm, Wallraf-Richartz-Museum, Cologne. Larger image. "1In those days Caesar Augustus issued a decree that a census should be taken of the entire Roman world. 2(This was the first census that took place while Quirinius was governor of Syria.) 3And everyone went to his own town to register. How cute to see some girl's doll, recruited at the last minute and wrapped tightly in a blanket, lying amidst the straw of an X-ended manger that dwells the remainder of the year in the church attic. Jessica stands in for Mary, while Robert, the tallest boy in Sunday school this year, makes a perfect Joseph -- once they've applied his fake beard. 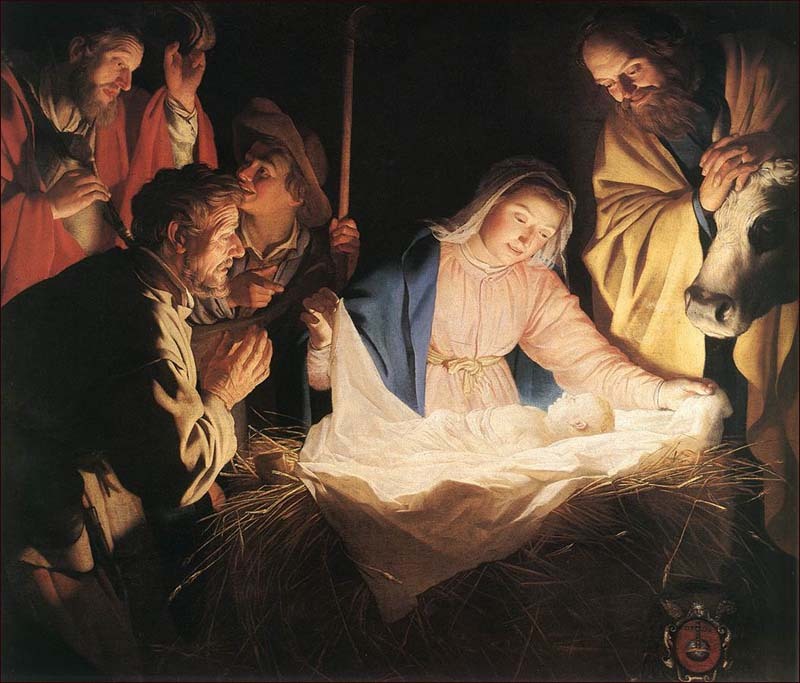 Jesus is born in history. Jesus is born in David's birthplace. Jesus' birth is attended by hardship. Jesus is born in humble circumstances. Jesus has an historical context; he's neither a myth nor a legend. He is both historical and verifiable. He is mentioned not only in the New Testament, but by contemporaries and early documents such as Josephus, Pliny, Tacitus, Suetonius, Bar-Serapion, Thallus, Lucian, and the Talmud.1 Jesus is a person in history. Q1. (Luke 2:1-2) Why does Luke name the rulers in 2:1-2? What point is he making? The most glorious event in history is about to unfold, but for Joseph and Mary it is drudgery and hardship. Mary and Joseph live in Nazareth, four days journey north of Bethlehem. Mary is pregnant. A journey late in pregnancy is arduous for her. But if she stays in Nazareth she has to face scandal alone. Luke puts it delicately: "... Mary, who was pledged to be married to him and was expecting a child" (2:5). An arduous journey in winter, a pregnant teenage mom. Who says that following God's plan is easy? Just because we face hardships and obstacles is no indication that God is absent, that we've missed his will. Q2. Why do you think the journey to Bethlehem was difficult for Mary? Is pleasure an indication that we are in God's will or not? Any examples from your life? Extra Credit: Argue for or against this proposition: "Being a consistent Christian causes more hardships than just going with the flow." The manger astounds me. 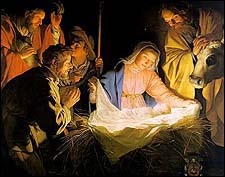 The holy Son of God was born in a stable or cave where animals were kept and his first crib was a common cattle trough. Why? Though Jesus was by very nature God (Philippians 2:6), he didn't grasp at his prerogatives or flaunt his rights. Instead, he "made himself nothing (kenoō), taking the very nature of a servant, being made in human likeness...." (Philippians 2:7). Kenoō means "make empty." Jesus literally "emptied himself" of all the privileges to which he was heir. He didn't just take a low place, he took the lowest place. His commission was "to preach good news to the poor" (Luke 4:18; quoting Isaiah 61:1), so he was born among the poorest of the poor. His disciples argued about who would be greatest in the Kingdom, but Jesus stopped them short: "For even the Son of Man did not come to be served, but to serve, and to give his life as a ransom for many" (Mark 10:45). The manger represents serving. But the manger was more than a symbol of humility. God planned it as a sign. Let's read on. They lived outside most of the year. "Abiding in the field" (KJV) is the Greek verb agrauleō, "live out of doors. "12 Flocks were kept outside in this way from April to November, and, sometimes during the winter in suitable locations.13 Shepherds were constantly with their sheep, since the sheep were vulnerable to all kinds of trouble. "Keeping watch" is a combination of two related Greek words, phulassō, "to carry out sentinel functions, watch, guard,"14 and phulakē, "the act of guarding." Together they carry the idea of "keep watch, do guard duty. "15 The shepherds made sure that the sheep were safe from wandering off and injuring themselves, as well as dangers from thieves and wolves. The brightness is more than just mega-candlepower. It is the radiance of God's own glory. "Glory" (doxa, which we also see in verse 14) refers to "the condition of being bright or shining, brightness, splendor, radiance. "16 Throughout the Old Testament the presence of God is referred to as overwhelmingly bright, burning as fire, such as the cloud above the tabernacle by day and the pillar of fire by night (Exodus 16:7, 10; 40:34-35; 1 Kings 8:11; Isaiah 6:3; 40:5; 60:1; Ezekiel 3:23; 2 Corinthians 3:18; 4:4; etc.). God's angels sometimes bear this same bright glory (Matthew 28:3; Luke 24:4; Daniel 10:6). In this case the glory shines around the whole area. The shepherds are frozen in terror. "Terrified" (NIV) or "sore afraid" (KJV) reads, literally, "feared with a great fear." Q3. (Luke 2:7-8) Why do you think the message of Jesus' birth comes to shepherds, of all people? Why is Jesus born in a stable with a manger for a bed? This has to be intentional. What point is God making? This Good News angel has the enviable task of being the first herald of Messiah's birth. "Bring good news" (NIV) or "bring good tidings" (KJV) is the Greek verb euangelizō, from which we get our English word, "evangelize." Here it means, "bring good news, announce good news." Later in the New Testament it is widely used for "proclaim the message of salvation, preach the gospel. "17 This is very good news that results in joy,18 intensified by the Greek adjective megas, "great, above standard in intensity. "19 This is great joy indeed! Notice how broad is the angel's message. It is not for just the pious or for the Jew, but "for all the people." What wonderful news for those who are estranged from God and struggling under oppression! The baby is not just born to Mary and Joseph. The baby is born "to you" -- to the shepherd recipients of the message and all others. Finally, the angel utters the words that Jews had longed for centuries to hear -- "He is Christ the Lord." Messiah! This Child is Messiah! Our English word "Christ," of course, comes from the Greek adjective christos, "anointed," which translates Hebrew mashiah, transliterated in English as "messiah. "22 The angel's declaration, however, doesn't use the word "Christ" by itself, but in the phrase, "Christ the Lord." "Lord" (kurios) means "owner, lord, master, a designation of any person of high position. "23 Jews were used to reading "Lord" whenever the divine name "Yahweh" appeared in Scripture, so to Jewish ears, these two words, christos and kurios spoke of divinity. The meaning seems to "the highest conceivable and most lofty designation of Christ,"24 that is, "The Lord Messiah" or "the Messiah (and) the Lord" with connotations of kurios used of Yahweh himself, rather than just of an exalted personage -- a Savior who can be regarded as the Messiah-Yahweh.25 The implications of this exalted title are staggering! Q4. (Luke 2:11) What are the three titles of Jesus given by the angels? What does each mean? What does this tell us about Jesus' true identity? "Sign" (sēmeion) means "a sign or distinguishing mark whereby something is known, sign, token, indication. "26 The sign consists of two elements. The baby is: (1) wrapped in cloths, and (2) lying in a manger. The phrase "wrapped in swaddling clothes" (KJV) or "cloths" (NIV) translates the Greek verb sparganoō, "to wrap in pieces of cloth used for swaddling infants, wrap up in cloths. "27 These were "strips of cloth like bandages, wrapped around young infants in order "to keep their limbs straight. "28 This was pretty common. The crowd is described with two phrases: (1) "great company" or "multitude"31and (2) "heavenly host." "Host" is the Greek noun strateia, a military term that means "army. "32 God's heavenly army is mentioned several times in scripture (Joshua 5:14; 2 Kings 6:17; Psalm 34:7; 103:21; 148:2). This heavenly army is praising God.33 It may have been a heavenly choir as in popular Christmas lore, but the scripture doesn't explicitly say that they are singing as the angels in Revelation (5:11-13; 15:3). Here they seem to be chanting in unison or speaking (Greek legō, "utter words, say"). The content of their praise is (1) to give glory to God and (2) to offer a blessing of peace to men. "Glory" (doxa) is used here in the sense of "honor as an enhancement or recognition of status or performance, fame, recognition, renown, honor, prestige. "34 The angels promise peace (Greek eirēnē) -- peace between God and mankind, which essentially amounts to salvation. We're used to the wording: "on earth peace, good will toward men," (KJV) but more ancient Greek manuscripts indicate a better translation: "on earth peace to men on whom his favor rests" (NIV).35 The idea is that God extends his peace and salvation to his favored people, those whom he sovereignly chooses or elects to favor and save. Mary has much to think about. "Treasured up" (NIV) or "kept all these things" (KJV) is suntereō, "to store information in one's mind for careful consideration, hold or treasure up (in one's memory). "36 "Pondered" is sumballō, "to give careful thought to, consider, ponder," something similar to our colloquial "get it all together. "37 She has a lot to process, a lot to make sense of. The shepherds do also. The final scene in this passage finds the shepherds climbing back up the hill to where their flocks lie. The angel had told them what to expect and that's just the way they found it. We leave them glorifying (doxazō) and praising (aineō), the appropriate response to this unforgettable night. Q5. (Luke 2:17-20) Great joy, praise, curiosity, amazement, telling others, thoughtful meditation. Which of these responses to the Good News are present in your life? In what manner do they show themselves? If some are missing, why? What can you do to recover these responses? The Good News is for all people, Jew and Gentile alike. Appropriate responses to this Good News include "great joy" (2:10), praise (2:13-14, 20), curiosity to confirm its truth (2:15-16), amazement (2:18), telling others (2:17), and thoughtful meditation (2:19). Nowhere do we see unbelief. Father, what an amazing night the shepherds had! To have a glimpse of your heavenly glory, to hear a mighty army chant your praise, to see the Messiah-Child, to listen to the angel recite his glorious titles -- Savior, Messiah, Lord. Thank you for letting us hear the story again. Write it large and indelibly in our hearts that we might be fervent Good News tellers, too. In Jesus' name, we pray. Amen. Josh McDowell, Evidence That Demands a Verdict (Campus Crusade for Christ, 1972), documents all these references and more in Chapter 5: "Jesus--a Man of History," pp. 83-89. Josephus, Antiquities 18.1-3,26, referred to in Acts 5:37. The controversy surrounding Quirinius and this census are discussed fully in Craig L. Blomberg, "Quirinius," ISBE 3:12-13; and Marshall, Luke, pp. 99-105. Usually Romans conducted a census where residents lived, but there is a precedent for the procedure we see in Luke 2:3-5. A decree of C. Vibius Maximus, dated in AD 104, required absentees to return to their home towns for a census in Egypt (P. Lond. 904, 20f; cited in J.M. Creed, St. Luke, London: Macmillan, 1930). A phrase in John Hopkins Jr.'s carol "We Three Kings" got me wondering: "Born a king on Bethlehem's plain" (1857). How could a town in the "hill country of Judah" have a plain? Bethlehem sits near the crest of the Judean central mountain spine that runs north and south in Israel, west of the great rift valley and east of the coastal plains that taper down to the Mediterranean to the west. A look at Google Earth or Google Maps makes clear its mountainous topography, as do photos of the town. Yet we see general reference to a plain in "Joy to the World" ("rocks, hills, and plains"), Isaac Watts (1719). But the references to a plain in Bethlehem where shepherds watched sheep is especially clear among nineteenth century song writers: "It Came Upon a Midnight Clear" ("above its sad and lowly plains..."), Edmund H. Sears (1849); "Shepherds Watching O'er the Plain," Mrs. Gaskell (1916); "The Shepherds on Fair Bethlehem's Plain," Edward G. Selden (1916), "Bless�d Night, When First that Plain," Horatius Bonar (1857); "When, Marshaled on the Nightly Plain," Henry K. White (1812); "Far, Far Away on Judea�s Plains," John M. Macfarlane (1869); and "On Judah's Plains as Shepherds Sat," unknown author (1849). Even Edersheim's editor in Life and Times of Jesus the Messiah (1887) makes that mistake (1:187). I guess in their romanticizing of the birth of Christ, song writers in the nineteenth century never traveled to the Holy Land. The date of December 25 goes back to Hippolytus (AD 165-235), and Chrysostom (AD 345-407), who stated in 386 that December 25 is the correct day. Brief discussion in William P. Armstrong and Jack Finegan, "Chronology of the New Testament," ISBE 1:688. Morris, Luke, p. 84. He cites Rabbinical sources that flocks were only to be kept in the wilderness (Mishnah, Baba Kamma 7:7; Talmud, Baba Kamma 79b-80a). Any animal found between Jerusalem and a spot near Bethlehem must be presumed to be a sacrificial victim (Mishnah, Shekalim 7:4). Joachim Jeremias, "poimēn, ktl.," TDNT 6:485-502. Joachim Jeremias, Jerusalem in the Time of Jesus (SCM/Fortress Press, 1969), pp. 304-305. He cites b. Sanh. 25b; Strack and Billerback II, 114; M.B.K. x.9; T.B.K. xi.9, 370; b. Ket. 62b; b.B.K. 94b Bar. Green, Luke, p. 130, disputes this analysis. Rather, he sees them merely as "peasants, located toward the bottom of the scale of power and privilege." Marshall, Luke, p. 108, too, notes that the tradition of despised shepherds is late. Jeremias, "poimēn, ktl.," TDNT 6:489. Marshall, Luke, p. 108, cites Strack and Billerback II, 114-116; Morris, Luke, p. 84. Chara, "the experience of gladness, joy" (BDAG 1077). See notes on mashiah, TWOT #1255c. Walter Grundmann, "chrio, ktl.," TDNT 9:532-33, quoting H. Sahlin. Marshall, Luke, p. 110. Cf. Green, Luke, p. 135. Sparganoō, BDAG 936. We don't use the English word "swaddle" much any more, but it is derived from the Old English word swathain, "to swathe, bind, wrap." Marshall, Luke, p. 106, cites Ezekiel 16:4 and Wisdom 7:4. Phatnē, BDAG 1050. The lexicographer indicates that the term "could perhaps be a stable or even a feeding-place under the open sky, in contrast to kataluma, a shelter where people stayed." The predominant idea of this word group is of feeding animals. Martin Hengel, phatnē, TDNT 9:49-55, denies the possibility in our context that this can be translated "stall." Ibid. Also Joachim Jeremias, "poimēn, ktl.," TDNT 6:491, fn. 59. A cave in Bethlehem was honored by Christians as Christ's birthplace as early as the early second century AD. Plēthos, "crowd, throng, host, assembly" (BDAG 825-826). Aineō, here and in verse 20, means "to praise," with the root idea of "express approval" (BDAG 27). "Glory" is often used in the New Testament in the context of praise: Luke 19:38; Ephesians 1:6; 3:21; Philippians 2:11; Revelation 5:13 (BDAG 257-258). These angels honor God as being highest (Greek hupsistos) in a spatial sense, in contrast to earth (mentioned in the next phrase) (BDAG 1045). Also Georg Bertram, "hupsistos," TDNT 8:619.